Numerous conditions causing swelling of the parotid gland are known including: masseteric hypertrophy due to constant clenching, bruxism or gum chewing; sialadenosis (alcoholism, endocrine disorders, eating disorders); bacterial or viral infections (acute suppurative parotitis, epidemic parotitis, HIV); autoimmune diseases (Sjögren syndrome); granulomatous diseases such as Wegener granulomatosis or sarcoidosis; congenital diseases (polycystic parotid disease); induced diseases (pneumoparotid, anesthesia or radioactive iodine sialadenitis); neoplastic diseases (Warthin tumor); direct trauma and sialolithiasis [1Mandel L, Surattanont F. Bilateral parotid swelling: A review. Oral Surg Oral Med Oral Pathol Oral Radiol Endod 2002; 93(3): 221-37. [http://dx.doi.org/10.1067/moe.2002.121163] [PMID: 11925529] , 2Neville BW, Damm DD, Allen CM, Chi AC. Oral and maxillofacial pathology 4th ed. 4th ed.2016.]. Unilateral or bilateral parotid gland swelling is also a reported side effect of chlorhexidine mouthwash [3Addy M, Moran J. 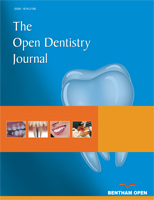 Clinical periodontology and implant dentistry 2008; 744-65.]. Chlorhexidine, a bis-biguanide cationic antiseptic active against Gram-positive and Gram-negative bacteria, has been widely used in medical practice since its introduction in 1954 as an antiseptic cream and has been successfully used in dentistry since the 1970s and considered the gold standard for antimicrobial mouthwashes [4Flötra L, Gjermo P, Rölla G, Waerhaug J. Side effects of chlorhexidine mouth washes. Scand J Dent Res 1971; 79(2): 119-25. [PMID: 5280246] ]. Parotid gland swelling after chlorhexidine mouthwashes is an uncommon adverse reaction. Its estimated incidence among patients who regularly use this product is less than 1.0% [5Van der Weijden GA, Ten Heggeler JM, Slot DE, Rosema NA, Van der Velden U. Parotid gland swelling following mouthrinse use. Int J Dent Hyg 2010; 8(4): 276-9. [http://dx.doi.org/10.1111/j.1601-5037.2009.00419.x] [PMID: 20961383] ]. This condition resolves spontaneously within a few days after suspending use of the mouthwash [5Van der Weijden GA, Ten Heggeler JM, Slot DE, Rosema NA, Van der Velden U. Parotid gland swelling following mouthrinse use. Int J Dent Hyg 2010; 8(4): 276-9. [http://dx.doi.org/10.1111/j.1601-5037.2009.00419.x] [PMID: 20961383] ]. To date, six cases of parotid gland swelling due to use of 0.12% chlorhexidine mouthwash have been reported in the scientific literature and only one case due to use of a different mouthwash containing 0.1% hexetidine (a saturated pyrimidine derivative cationic antiseptic) [5Van der Weijden GA, Ten Heggeler JM, Slot DE, Rosema NA, Van der Velden U. Parotid gland swelling following mouthrinse use. Int J Dent Hyg 2010; 8(4): 276-9. [http://dx.doi.org/10.1111/j.1601-5037.2009.00419.x] [PMID: 20961383] , 6McCoy LC, Wehler CJ, Rich SE, Garcia RI, Miller DR, Jones JA. Adverse events associated with chlorhexidine use: results from the Department of Veterans Affairs Dental Diabetes Study. J Am Dent Assoc 2008; 139(2): 178-83. [http://dx.doi.org/10.14219/jada.archive.2008.0134] [PMID: 18245686] ] (Table 1). Cases of parotid gland edema following antiseptic mouthwash reported in literature. The patient, a healthy 66-year-old Caucasian male, underwent maxillary sinus augmentation with lateral approach on the right side in an outpatient procedure under local anesthesia with piezoelectric antrostomy as described elsewhere [7Stacchi C, Vercellotti T, Toschetti A, Speroni S, Salgarello S, Di Lenarda R. Intraoperative complications during sinus floor elevation using two different ultrasonic approaches: A two-center, randomized, controlled clinical trial. Clin Implant Dent Relat Res 2015; 17(Suppl. 1): e117-25. [http://dx.doi.org/10.1111/cid.12136] [PMID: 23968289] , 8Stacchi C, Lombardi T, Cusimano P, et al. Bone scrapers versus piezoelectric surgery in the lateral antrostomy for sinus floor elevation. J Craniofac Surg 2017; 28(5): 1191-6. [http://dx.doi.org/10.1097/SCS.0000000000003636] [PMID: 28538071] ]. The patient was prescribed amoxicillin-clavulanate (875+125 mg twice a day for 5 days) in combination with metronidazole (250 mg three times a day for 5 days). As part of postoperative care, the patient was instructed to rinse with 0.2% chlorhexidine mouthwash three times a day for one week until suture removal. After only three days, the patient presented at our clinic, reporting sudden swelling of the left cheek (Fig. 1 ). The patient underwent thorough clinical and instrumental examination. Swelling was evident in the left parotid region with no sign of inflammation (redness, fever, or pain) and in absence of any other symptom. All teeth on the left side were asymptomatic, with no sign of acute inflammation or infection. Clear saliva flowed from the Stenone duct after squeeze maneuvers on the left parotid gland. A panoramic radiograph and ultrasound examination of the gland were performed to exclude other pathological conditions, confirming the presence of edema and hyperemia of the gland (characterized by increased blood flow revealed by colour Doppler ultrasound, (Fig. 2 )), with no other organic alteration. Therefore, a diagnosis of parotid gland swelling due to chlorhexidine rinsing was formulated. The patient was advised to stop rinsing immediately and his condition was monitored over the following days. On the evening of the same day swelling increased and the patient presented at an emergency department where a single dose of intravenous methylprednisolone (40 mg) was administered, without suspending antibiotic therapy. The patient had never previously experienced similar adverse events. Unilateral parotid swelling on the left side (frontal and sagittal view). 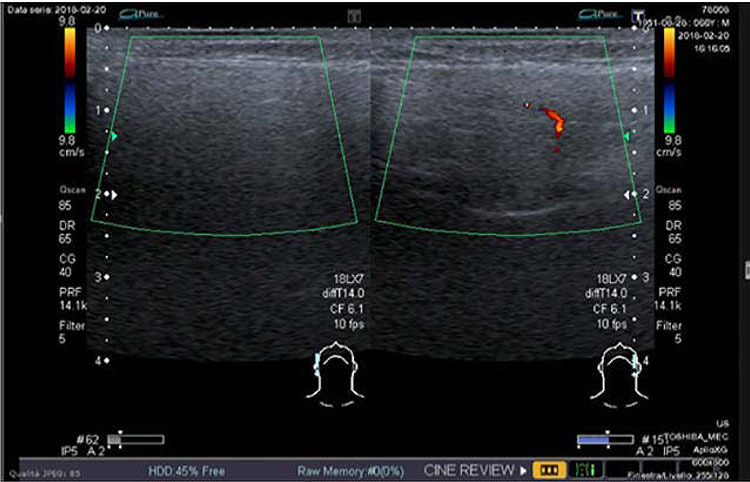 Comparative ultrasound evaluation of the parotid gland, appearing inhomogeneously edematous on the left, with minimal increase in vascularization, in a reactive/phlogistic pattern. After seven days, at suture removal, parotid swelling had decreased significantly and the patient reported no other signs or symptoms. Healing of the surgical wound (contralateral side) was uneventful. Three weeks later, the patient presented at the follow-up appointment with no sign of swelling and complete remission of symptoms. This case report describes an apparent correlation between unilateral parotid gland swelling and chlorhexidine mouthwash. In differential diagnosis, infective etiology was excluded due to the administration of broad-spectrum antibiotic therapy and absence of typical signs of inflammation or infection such as pain, fever or altered salivary flow (in either quantity or quality).-The allergic reaction was excluded due to delayed onset of swelling and its unilateral localization. No salivary duct stones or masses were found and all diagnostic tests resulted negative. No trauma was reported by the patient and iatrogenic etiology related to the recent surgery (pneumoparotid, anesthesia) was excluded as sinus augmentation was performed on the opposite side. No bad habits (alcoholism, eating disorders, bruxism or gum chewing) were referred and all other possible diseases were excluded after analysis of the patient's medical history. The pathogenetic mechanism by which chlorhexidine causes parotid swelling still remains unclear. It has been suggested that vigorous rinsing may cause mechanical obstruction of the parotid duct and predispose individuals to unilateral or bilateral parotid swelling and inflammation (sialadenitis). This hypothesis is supported by swelling remission after recommending gentler or cessation of rinsing [9Rushton A. Safety of hibitane. II. Human experience. J Clin Periodontol 1977; 4(5): 73-9. [http://dx.doi.org/10.1111/j.1600-051X.1977.tb00053.x] [PMID: 275279] ]. An alternative consideration suggesting a mechanical cause is that parotid gland swelling has been reported after use of chlorhexidine mouthwash, but not after other methods of chlorhexidine administration. How this obstruction occurs, is still under debate. Vigorous rinsing may cause the mouthwash to enter the parotid duct with consequent inflammatory reaction and edema, causing narrowing of the lumen and a transient obstruction [9Rushton A. Safety of hibitane. II. Human experience. J Clin Periodontol 1977; 4(5): 73-9. [http://dx.doi.org/10.1111/j.1600-051X.1977.tb00053.x] [PMID: 275279] ]. An alternative explanation is that chlorhexidine may reduce natural resistance of the mucous membranes to viral infection. Bacteriostatic effect of this mouthwash and its precipitating action on salivary mucins covering the oral mucosa reduces the bacterial load and may alter the oral environment [4Flötra L, Gjermo P, Rölla G, Waerhaug J. Side effects of chlorhexidine mouth washes. Scand J Dent Res 1971; 79(2): 119-25. [PMID: 5280246] ]. However, parotid gland swelling in this case report arose after three days of chlorhexidine use which is too short a treatment period to cause deep alterations of the oral environment. Therefore, parotid swelling following the use of chlorhexidine mouthwash here described is possibly the result of the rinsing procedure itself. A complete explanation, however, remains unavailable. Parotid gland swelling, although very uncommon, is a possible side effect of chlorhexidine mouthwash when other organic or infective conditions have been excluded. The correct clinical and instrumental examination should be performed in order to evaluate every possible pathological condition related to parotid swelling. Even if the pathophysiological mechanism has still not yet been clearly determined, the patient showed a good response to corticosteroid administration. Parotid gland edema as a side effect of chlorhexidine mouthwash should be considered in the differential diagnosis of acute swelling of the parotid gland and in appropriate preventive and therapeutic strategy. Informed consent was obtained from the patient prior to being enrolled in the study. The Authors wish to acknowledge Dr. Gabriele Bazzocchi for the execution and interpretation of ultrasound examination. Neville BW, Damm DD, Allen CM, Chi AC. Oral and maxillofacial pathology 4th ed. 4th ed.2016. Addy M, Moran J. Clinical periodontology and implant dentistry 2008; 744-65.